Often in applications that work with databases, you need to realize the sorting of data for some field, which is selected by mouse clicking on it’s title. This problem is solved in this task. 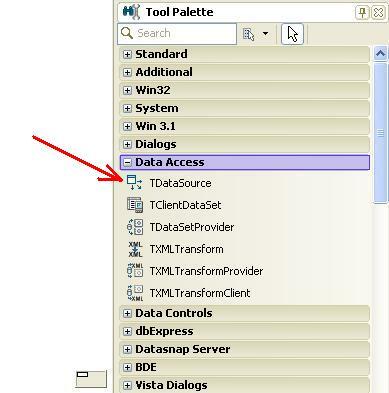 Database “01_02_00_010_mydb.mdb”, which was formed by Microsoft Access, is given. You need to develop the application, which shows table “Marks”. 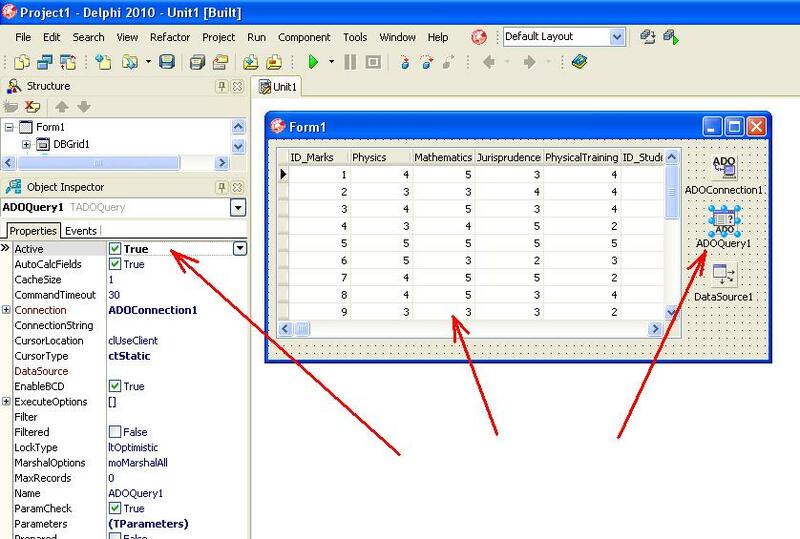 Into the table “Marks”, you need realize the sorting of data using all fields. You need realize the sorting in ascending or descending order. Start of sorting should be called when you click on the header of the corresponding field of table “Marks“. The interconnection scheme between tables is shown in Figure 1. 1. Run Embarcadero RAD Studio. The name of module of main form is “Unit1.pas” by default. The project name is “Project1.dproj” by default. 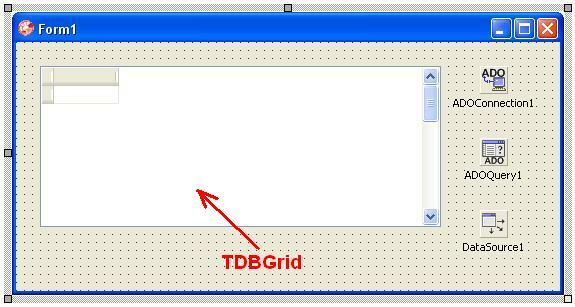 – from tab “Data Controls” component of type TDBGrid to showing the results of SQL-query, which is formed in component TADOQuery (Fig. 4). After placing of components, the application form will be following (Fig. 5). 3. Connecting database to application. 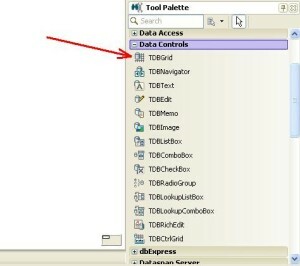 To connect the application to database, you need to set the property ConnectionString of component ADOConnection1. Process of setting up “ConnectionString” is described here in details. 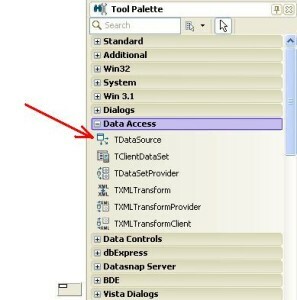 When you form the property ConnectionString in wizard windows, you need to set provider OLE DB – “Microsoft Jet 4.0 OLE DB Provider”. 4. 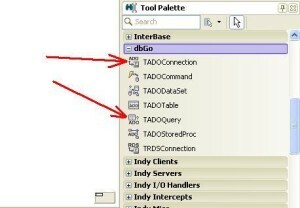 Setting up the interconnections between components ADOConnection1, ADOQuery1, DataSource1, DBGrid1. 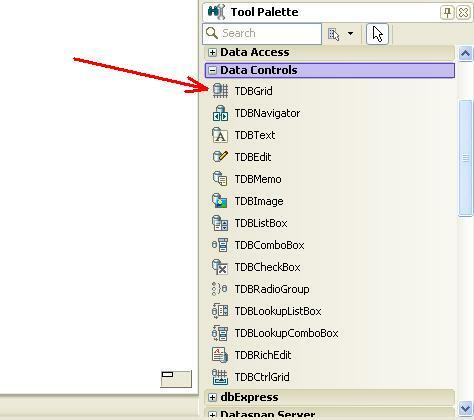 – in the component DBGRid1 property DataSource = “DataSource1“. 5. 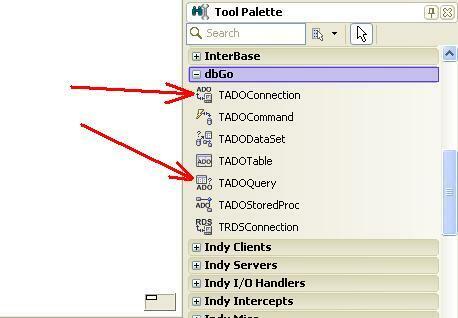 Setting up of component of TADOQuery type. Next step, you need to set up component TADOQuery. 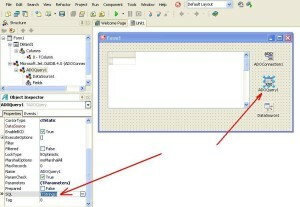 To do it, in “Object Inspector” you need to select property “SQL” by clicking on “…” (Fig. 6). 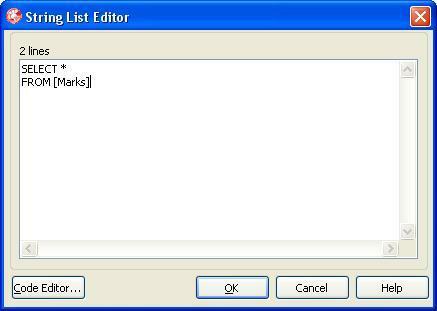 As a result, the window of editor “String List Editor” will be opened. 6. Property “Active” of component ADOQuery1. 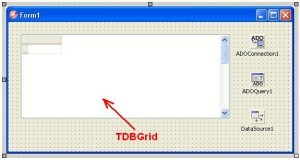 Next step – displaying the table “Marks” in component DBGrid1. – set the property “Active” to value “true“. As a result, table Marks will be displayed in component DBGrid1. Data of table, which are displayed, are based on the SQL-query, which is formed in property “SQL” of component “ADOQuery1” (Figure 8). 7. Creating a program code of sorting data in the fields of table “Marks“. 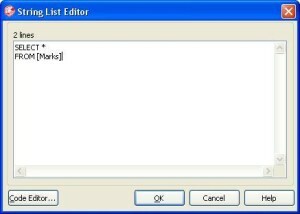 Now it is needed write the program code of sorting, when user does the click on the title of any field. If user clicks on the title first time, then sorting is realized as ascending. If user clicks second time on the same field, then sorting is realized as descending and so on. When user clicks on the title of table in component DBGrid1, the event OnTitleClick is generated. If to intercept this event, it is possible to carry out the sorting on the desired field. 7.1. Inputting variables Order and Field. Order:boolean; // Variable, which points the type of previous sorting. – false – the sorting in descending. Variable “Field” points the number of field, for which were done previous sorting. 7.2. Programming an event of activation of form OnActivate. Event “OnActivate” is generated, when form must be opened after running the application. 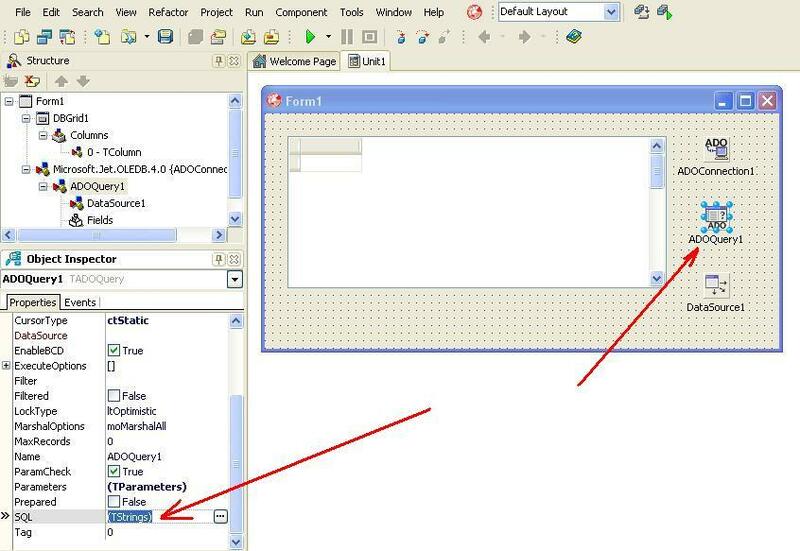 It is needed to type the code, which initializes variables “Order” and “Field“. When form is opened, the sorting of data is based on the field ID_Marks in ascending. Because, the variable “Order” must be equal “true” and variable “Field” must be equal 0. – do the double click by mouse in the field of event OnActivate. 7.3. 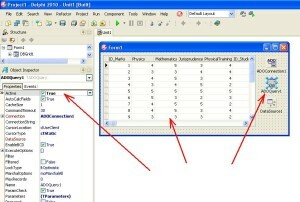 Programming the event of clicking on the title of table, which is displayed in DBGrid1. As mentioned earlier, when you clics on the title of table Marks, the event OnTitleClick is generated. Event handler gets as input parameter the column number “Column” of table, on which user did the click by mouse. On the basis of the value “Column” of the table, is defined the same or another field, on which user clicks. So, the variables “Field” and “Order” are formed. – method Add() adds a new text to the text of SQL-query. Previous Post009 – C# (term paper). Development of Automation Program of work of ManagerNext Post010 – C#. An example of demo application of copying files. Class FileStream.